From Archimedes to Newton, from inventors to entrepreneurs, that fleeting flash of inspiration is what generates great ideas,makes humans progress, keeps the world moving forward. For Adam Korakhiwala, his ‘a-ha’ moment came in the form of a grim statistic in the 2014 Annual Status of Education (ASER) report. ONLY 1 in 4 Std. 5 students can only read basic English sentences. At the time, Adam was a student of Public Policy with a minor in Computer Science at Stanford University. 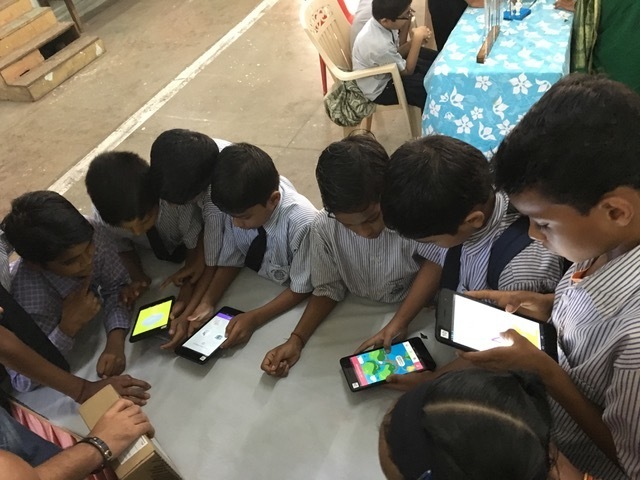 “I read the report as a Public Policy student, but when I started thinking about how I could be a part of the solution to a problem like this, my background in Computer Science kicked in” shares Adam, founder of mGuru, a Mumbai-based edtech startup, aimed at the K-12 sector of students in urban, peri-urban and rural India. A fundamental desire to bring great educational technology to any child, anywhere. After spending months at the Educo-run BMC Sai Baba Path School, Mumbai and classrooms in Akanksha and Teach for India schools, Adam’s seed of an idea began to germinate. He put together a team using ‘hustle and passion’ by posting on LinkedIn and techie job boards. mGuru is a mobile learning app for K-5 students, focusing on English and Math. The apps provide an interactive learning journey for children, with the explicit aim of accelerating learning outcomes in an engaging way. The vision of mGuru is to package the best learning practices and research into a platform for the masses, so that any child can have the tools to gain basic literacy and numeracy skills. “We aim to significantly increase learning outcomes at scale, and we hope to build a platform that delivers that.” avers Adam. While smartphone penetration is on the upswing across India, the mGuru team is cognisant of other infrastructural issues related to internet connectivity that much of the country still faces. Once the initial prototype of the application was ready the team tested it with 100 3rd and 4th standard public school students, in Mumbai. “Our team would go in every week to see how children were reacting to the app, what they liked, what they ignored… and then every week we would go back and incorporate those learnings into the app” remembers Adam. After multiple rounds of tinkering, and a complete redesign to be more “pedagogically sound and engaging for kids” the mGuru app was officially released in August, 2016.
mGuru’s English app is particularly successful with children as it gamifies the learning process. Within mGuru English, there is a reward system in the form of mangoes. By completing various activities, Manu the monkey collects mangoes which the child can then use as currency to purchase stories to read available on the app. All these stories are from StoryWeaver, an online digital repository of multilingual children’s stories from Pratham Books. While the stories on the apps are in English, it also has a button, which the child can touch for the story to be translated to another language they are more fluent in. Currently, mGuru English teaches English via Bengali, Gujarati, Marathi, and Hindi. However, they plan to expand this to integrate more major Indian languages such as Tamil, Kannada, Malayalam, and Urdu. The stories offered are regularly updated so that children always have something new to read and enjoy. “The stories from StoryWeaver have already been read 45,000 times who have done over 185,000 activities!” Adam shares enthusiastically. mGuru has partnered with NGOs such as Teach for India, Akanksha, and Yuva Unstoppable and is currently used by 17,000 students all over India, and contains 185,000 activities. Impact is measured by looking at various statistics such as the time spent on the app, how often students return to the app, the number of stories read, and improvements in the scores of students. “During our research phase, we learned that almost all the students in the schools we visited went for some form of ‘tutions’ after school, which showed that parents were invested in improving their child’s learning. If parents were willing to pay anywhere between Rs.300-600 for tuition, then we felt they might be willing to pay an affordable Rs. 30 per month for our app. We reach out to parents to tell them about and help download the app at school PTAs. So far we have had a very positive response from them.” shares Adam. A sentiment echoed by this parent at Sai Baba Path Public School, Mumbai. mGuru is also experimenting with other novel ways getting their app into the hands of more children. Starting next month, they are tying up with a chain of bakeries in Kolkata, where each bakery will also be an mGuru distribution centre. “Every time someone shops at the bakery,they'll get an offer of three weeks free access to mGuru English app. We’ll have someone there to help them download the app and do a demo if needed. If this pilot works, we will look at ways to replicate this in other geographies.” Adam reports. The team is excited about future plans which include adding a math component to the app, adding more languages and more diverse content in the form of videos and diverse activities. “Everyone on the team has a fundamental passion and desire to bring great educational technology to any child, anywhere.” shares Adam.